I got the TiVo up and running again today (issues with it seeing the external hard drive so I just left the damn thing unplugged since the 3rd of September and just used the Apple TV...) When poking around I found an HBO app, so I activated it and started watching. I could activate it because my cable company was listed on HBO’s activation site. 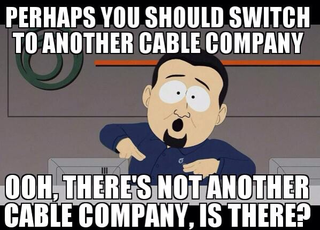 But when I tried the same thing again, selecting Apple TV instead of TiVo, whad’ya know - no listing for my cable company. Fine, Charter, you’re in bed with Roku - whatever. But I’m paying for your service so let me use whatever damn device HBO says is OK, OK?